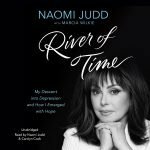 Grammy-winning country icon, best-selling author, actress, and in-demand speaker, Naomi Judd is set to release the paperback version of her new book, “River of Time: My Descent Into Depression and How I Emerged With Hope” on Dec. 5. Judd will be promoting the paperback release with multiple television, radio and online interviews, including an appearance on the TODAY Show Dec. 5. In “River of Time: My Descent Into Depression and How I Emerged With Hope,” Judd shares her harrowing personal experience with the severe depression that almost killed her. CLICK HERE TO ORDER. Judd first captured the attention of the entire world as half of The Judds, which she formed with her daughter Wynonna. The Judds sold 20 million records, scored fifteen No. 1 hits, and received more than 60 industry awards, including six GRAMMY® awards and seven consecutive CMA Vocal Group of the Year trophies. That ride came to a screeching halt when Naomi was diagnosed with Hepatitis C––and given only three years to live. Instead of accepting her fate, the former registered nurse educated herself and pursued healing. Today, Naomi is Hep C-free––a medically documented miracle. Written with Marcia Wilkie, “River of Time” picks back up with Judd in 2010. From there, she dives into her three-and-a-half years of nightmares, hospitalizations, psychiatric wards, drug poisoning and addiction, electroconvulsive shock treatments, suicidal thoughts, and more. Raw and unflinchingly candid, the book serves beautifully not as a voyeuristic joyride, but as a generous confession and clarion call for others to fight on and reach out. Throughout, readers of “River of Time” will explore the effects of Judd’s traumatic childhood filled with abuse and generations of mental illness. Judd also opens up about the electroconvulsive therapy (ECT) treatments that would ultimately bring her some long-sought relief, the strain that her illness brought her relationships with daughter Wynonna and husband Larry Strickland, the wisdom she received from friends and what others can do when suffering. Judd’s tale is gripping, and while she offers it with the deft skill of a natural-born storyteller, what matters most is her message. “River of Time” is more than just a compelling read. For many, it could be a life-saving one. For more information, follow Naomi Judd on Facebook or visit NaomiJudd.com. Hailing from the Appalachian​ ​foothills​ ​of Ashland, Ky., mother​ ​and​ ​daughter​ duo, The Judds, were first discovered by RCA​ ​label​ ​head​ ​Joe​ ​Galante​ ​in​ ​1983 ​after landing a spot on​ ​WSM-TV’s​ “​The​ ​Ralph​ ​Emery Show.” They​ ​made​ ​their​ ​chart​ ​debut​ ​by​ ​the​ ​end​ ​of​ ​the​ ​year​ ​with​ ​“Had​ ​A​ ​Dream​ ​(For​ ​The​ ​Heart),” and​ ​the​ ​two​ ​were​ ​on​ ​their​ ​way​ ​to​ ​a​ ​history​-making​ ​career. For​ ​the​ ​rest​ ​of​ ​the​ ​1980’s,​ ​each​ ​single​ ​from​ ​The​ ​Judds​ ​released​ ​by​ ​RCA​ ​went​ ​to​ ​the Billboard​ ​Top 10,​ ​with​ ​14 hits ​going​ ​all​ ​the​ ​way​ ​to​ ​number​ ​one.​ ​ The​ ​Judds​ ​embarked​ ​on​ ​their​ ​“Farewell​ ​Tour”​ ​in​ ​1991 ​after​ ​Naomi’s​ ​diagnosis​ ​of​ ​Hepatitis C​ ​forced​ ​her​ ​to​ ​retire​ ​from​ ​the​ ​road.​ ​Wynonna​ ​launched​ ​a​ ​successful​ ​solo​ ​career​ ​with​ ​her self-titled​ ​5x​ ​multi-platinum ​debut​ ​album. Her​ ​first​ ​three​ ​singles also reached​ ​No.1​ ​on​ ​the​ country​ ​charts and has become a country icon in her own right.​ ​Naomi​ ​focused​ ​on​ ​her​ ​health,​ ​beating​ ​the​ ​disease, writing​ ​several​ ​New​ ​York​ ​Times​ ​best-selling​ ​books​ ​and​ ​becoming​ ​a​ ​popular​ ​motivational speaker.​ For more information, visit naomijudd.com. Find the most current Naomi Judd tour dates from our partners at Country Music On Tour, your trusted country concert ticket source! Country Music News Blog participates in advertising programs that help fund the operation of this site. For more information please visit our privacy statement. This entry was posted in Naomi Judd by Shauna "WhiskeyChick" Castorena. Bookmark the permalink.